Free concerts on an outdoor stage, weather permitting. Seating at bleachers, tables and on the lawn. Pleasant setting with a view of the boardwalk. 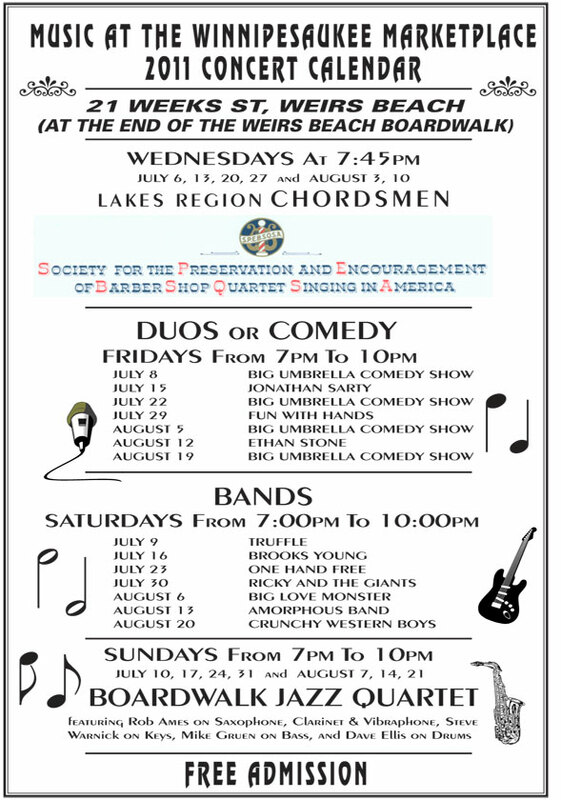 Featured are Barbershoppers every Wednesday; Duos alternating with Comedy on Fridays; Band Concerts on Saturdays; and the Boardwalk Jazz Quartet every Sunday. Call 366-5800 for a schedule or more info. To go the websites of some of the bands and musicians that appear at the Winnipesaukee Marketplace during the summer, click on the name of the band.